You may know Cha-Ching! as the sound of a cash register ringing-but Jeffrey Gitomer hears it in every aspect of business, as the sound of achievement, fulfillment, money, wealth, and so much more! Music that makes you feel great every time you hear it. Cha-Ching! sets the tone for more Cha-Chings! and gives you the self confidence that if you have rung the register once, you can ring it again, and again (and again). The continued achievement, motivation, and inspiration, adding up to a choir of melodic sweetness. It's the sweet sound of success. 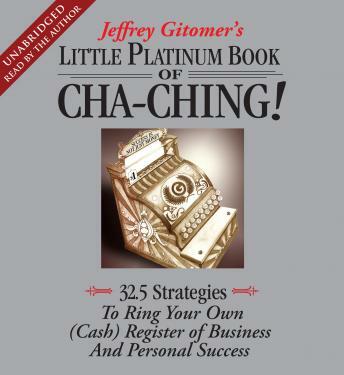 Jeffrey Gitomer's 32.5 Strategies To Ring Your Own (Cash) Register of Business And Personal Success will help you make your own music, dance to your own rhythm, and ring your own register. The CASH register.